This post will be about binding and loosing. We hope to shed light on this subject in a way that you may not have thought about it before. There are so many things that we pray for and we wait for God to respond when in fact God has already told us what to do. He has already given us the strategies that we need in order to succeed. God is not going to come to earth and do the things that He has already given the church the authority or ability to do. That is what binding and loosing is all about. Using the spiritual authority we already have to carry out the work of the Kingdom. Before we get into this teaching let’s define what a semi-colon is. Yes, a semi-colon (;). A semi colon can be used in the place of a comma. It is mainly used to continue a sentence that could be finished by a full stop, but is too long to have a comma. Or not quite right to have a comma. Why is this important? Well, in order for us to properly understand the scripture that we will share about binding and loosing it is important to understand that a semi-colon is used to continue the same sentence. When we understand this it is much easier to get the significance of this scripture. Yes, it is so subtle but so true. The authority has been given to the believer in Christ Jesus to bind and loose. This is the key. You bind and You Loose. You have this power so God has already given you the ability to take action and all you have to do is use it. 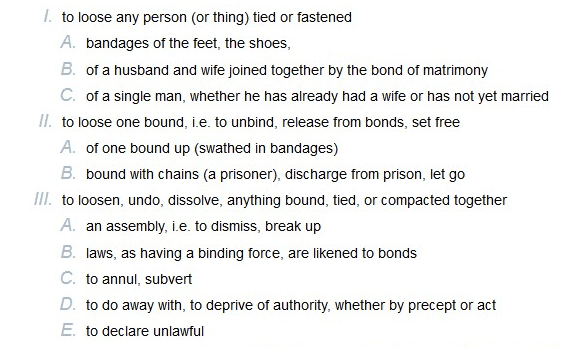 So when you bind something you are forbidding it, prohibiting it from happening and putting it in chains. So, loosing is the opposite action. You are untying something loosening it. You are setting it free. Now we will show you how to use this in prayer. Imagine that you see something happening around you and you know it’s not right, it’s not godly, it’s demonic, it’s an injustice, it is a complete violation of the word of God (this is not your opinion or your feelings). Once you identify that this is not the will of God you have the authority to bind it up and to loose the Kingdom and all of it’s righteousness in place of that! So your prayer would sound like this “I bind up pride in the name of Jesus and I loose humility” So you would loose the opposite of what you are binding up. You could even pray this over yourself in whatever area you see that you may need it. When you bind up something you think of the opposite to loose over the situation. The prayer of binding and loosing is very effective if you use it as an offensive prayer. Don’t wait until you get into a situation or things get tense before you do this. If you know that you are about to face a confrontation or a bad situation you start binding and loosing before you even get to the scene. This will ensure that things are in order before you show up and God has already sent his angels to take care of it before you arrive. Jesus, according to Matthew 16:19 you said that you gave us the keys to the Kingdom and whatsoever I bind on earth is bound in heaven; therefore, I bind the enemy and every angel that was kicked out of heaven from interfering with Your blessings coming into my life. I bind every principality, every power, every might and dominion, every ruler of darkness and every spirit in high places from interfering in my life, my family, my health, my finances, my ministry, my business, my relationships with others and more importantly with you Lord. They will not be able to operate in any aspect of my life or have any influence over it, in Your Holy Name and according to your word Amen. Now remember that you can make this prayer as specific as you need it to be for your situation. If you are not sure of what you should loose for what you are binding up leave us a comment below and we’ll be happy to give you some suggestions. **Please note, that this binding and loosing is not a permanent prayer. What does that mean? You may need to do this all again tomorrow. The main reason is sin and it is the enemy’s job to get you in a sinful situation so that you lose the authority to stop him in his tracks. You can read more about this here in a post on Spiritual Warfare. 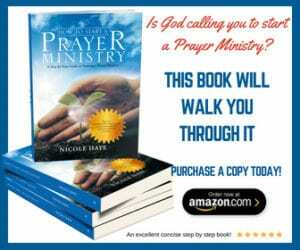 Under the beginner and intermediate stages it explains why some prayers get undone because of sin. Until then, God bless you and remember you have the power and authority to do this because it was given to you by Jesus himself. I have questions about this prayer. I am going through something I strongly believe will work but the other half is choosing to do something different. Will this prayer still work? Also can I have someone contact me to help me word things a little better? Idk rather not post it online. I want you to think of it as opposites. Binding & Loosing is opposite of each other. If you are going to bind something to you, what will you loose? So, if you are going to bind the word of God to you, you can’t bind it to your body because that’s not where it would be stored. You store the Word in your heart & mind, not on your physical body. The opposite of the Word (the truth) is a lie. Therefore, you can Bind the word of God to your heart & mind and loose the lies of the enemy. You need to think logically about it before you pray it. It must make sense. You can’t bind the fruit of the spirit to your body because….it’s spirit, so you need to bind it to your spirit. Stop and think it through. If you are binding the fruit of the Spirit to your spirit, then what are you loosing? And, isn’t the fruit of the Spirit a manifestation of the Spirit? So you can’t bind it to you, you have to bear it, manifest it. It’s fruit. Hope this makes sense. If you are still confused, don’t pray it. Ask God to give you a revelation of how to do this. Binding and loosing is replacing evil with good. Opposites. Hi I’m trying to better understand binding and loosing. Thank you for the feedback. If binding is to disallow or forbid then why is there seem to be contradictory advice by some to bind good things to yourself and to loose bad things (seems some are using as send away) from yourself. There are some amazing Pastors that are well versed in the Word that say to “ loose “ from our soul anger , lust , judgement , etc and then say to “ bind” love , joy, peace , etc to our soul. So I am confused because isn’t this the opposite of what you are saying to do? And if I have been using bind and loose in the way above , do I then have to somehow repent and cancel all those prayers or will God know my heart and what I meant . Im struggleing with lust….i bound him and loosed virtue….i just started the loosing prayer. My attacks are so strong at times i dont even realize its an attack till its over and im feeling defeated. Im not sure how i can hate and love something at the same time?? I first want to say that I am born again believer and know that I am in spiritual war. I am not sure how to proceed with the situation I am in. I am in a house share. That is where you rent a room and share the kitchen and bathrooms. The owners are a married couple and they are Mormons. They rent out 2 bedrooms. I am one and the person in question is in the 2nd bedroom. She is filled with sin….she comes into my bedroom and creates havoc. Taking things out and weeks sometimes months later she puts it back. Things like emptying my shampoo bottles, putting holes in my stockings and makeup on my white clothing. She mocks me, callls me names etc.. i know the perfecr responsenis no response. I went to thenowner and told him this. The person in question denies this and the owner doesnt beieive what I am saying. You could ask me to leave but the thing is this: i just left another houseshare for the same reason. The mother (owner)?of the house did the same things. I left, went to a different town, different people and the same thing is being repeated with this house. God obviously wants me to learn something but I am not sure what it is. I have annointed the house, pray for the people living there and plead the blood over myself and the house. I had a minister tell me that I need to learn spiritual warfare. I thought I was doing that. It obviously isn’t working, or I am not doing it properly. Do you have any advice for me? household My mom, my sister and myself own our homes and we do not want to move. Hi Debbie, the first thing I would do is ask God if you should move. It doesn’t matter what you want, what is God saying? Then you obey. If you stay in a situation that God is telling you to leave that means you have no covering because you are walking in rebellion. This is why it is important to find out first. Second, you need to bind the spirit of fear within you and your entire family. What is the opposite of fear? This is what you will loose. Then you need to bind the spirit of murder and addiction, loosing life. But outside of all of this you need to find out what the Lord’s will is first. Look at our list of prayers for the ones that are for protection and pray them daily. That will keep you covered until you hear from the Lord. Thank you for this. I need help and prayer. I just started researching the prayer of binding and loosing and I came across this post. I suspect my husband is using again. His attitude and demeanor and actions are not him and I prayed the first prayer yesterday. I researched information this morning to pray again because I don’t understand exactly what I’m doing or how to pray and I don’t want to do it wrong. This is very important to me and I have confidence in God’s power and authority but I want to be sure I’m praying correctly. Thank you very much and your prayers for my husband will be much appreciated! Thank You, MOP, I need the understanding on the keys of the kingdom, of how to bind and loose, so I thank you for breaking this down for us, who need to know.